This is a collection of the different versions of the (x)trees projected at different venues around the world. Below is a video clip about the (x)tree project. 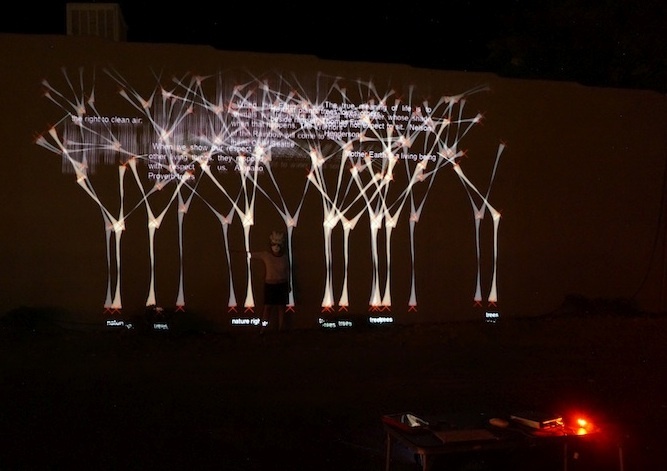 On September 26, 2014 we brought the (x)trees to The Paseo, a festival dedicated to bringing the art of installation, performance and projection to the streets of Taos, New Mexico. Occurring in collaboration with Taos Fall Arts Festival, The Paseo unites the 2014 fall arts venues, creating a new platform for the public display of art within the Taos Historic District. This piece, was last on view at the Albuquerque Museum ISEA2012 Machine Wilderness exhibit. 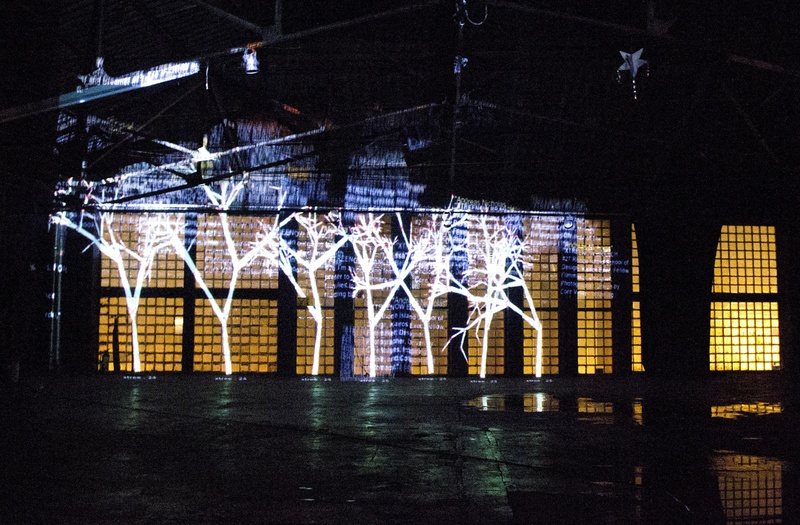 It evolved from my desire to explore data visualization and video mapping technologies to create an immersive contemplative space around the theme of trees. This piece was created in collaboration with creative coder and sound designer, Alessandro Saccoia. By integrating data mining from social networks and text messaging, people participate in the creation of the branches and see their message appear on the wall along with others being mined in real time. The audience could send a text message and see their message appear on the wall with a branch. Messages coming in from Twitter contain the designated key words (i.e. trees, nature rights), interspaced with archived inspirational quotes about nature gathered from the web, and the articles from the Universal Declaration of Nature Rights, signed into law in Ecuador for the first time. The experience was designed to be a catalyst for contemplative states of being that allow people to sense their global and local relationship to others, and to contemplate the value of trees and the rights of nature. The interactive sound was created by Alessandro in Pure Data and incorporates sounds collected from nature, crowds and a repeating Prana breath to bring people back to the awareness of their own breath. Special thanks to Twilio which makes possible the texting feature. The virtual trees were projected onto a 20′ x 20′ corner space and grew 12′ high in real time from the internet. Bean bag chairs allowed you to kick back and experience this immersive environment. This is version 5 of the (x)trees and it was re-written in OpenFrameWorks by Alessandro Saccoia, who also programmed the audio using sounds collected from nature and crowds. People can text or tweet live in front of the piece and catch a glimpse of their message as it floats up and dissapears. The tree-relevant messages are the source of this piece which brings attention to the value of trees and explores our interconnectivity in nature as in technology. This piece was installed at the Albuquerque museum for ISEA2012. The projection spanned 20 feet in either direction of a corner space. The total size was 12′ x 40′. You could send text messages with designated key words in the message to see your message, to create a branch which appeared on the wall within seconds (Thanks to Twilio!). More than 20 pairs of local visual artists and poets have collaborated to create work inspired by the issues raised by the international occupy movement. This installation was a collaboration with poet, Lyla Johnston. The (x)trees grew from “Occupy” tweets captured live from the internet. The growing trees were synchronized to Lyla’s recorded poem, “Dawn” and music from Paul Rudy‘s Zuvuya Cd of wonderful nature sounds. Alessandro Saccoia is the creative coder that makes the algorithmic xtree magic happen. The audio engineer and projectionist for this xtree event was Aidan Bain of Soundworks in Taos. Inauguration of the (x)tree project at 203 Fine Art, the host of the (x)tree for the Ledoux event. The (x)tree was projected into seven trees using general search terms such as christmas and snow, in addition to our code word xtreenow. The event was a benefit for TreeNM to help raise awareness to their plant a million trees campaign. This first version of the (x)trees started in December 2010 in collaboration with the Santa Fe Complex. The code was written in Flash by Jared Tarbell and projected from a browser. Joe Dean Abraham, the projectionist for the event was created the above timelapse. The event helped raise awareness to the Tree New Mexico project. The (x)trees was projected for the first time in an indoor space as an interactive installation where people were encouraged to play with the mapping code and position the trees. The event took place at IMPA, a factory in Buenos Aires taken over by workers and artists after the economic crisis. I worked with programmers Jeff Milton and Joe Roth to adapt the original Flash code written by Jared Tarbell. We create a database so that we could also save and visualize historical data, in addition to streaming random data. People could FOLLOW US on Twitter and a branch would automatically be generated in their name. Tweet by tweet, person by person, “growing” the algorithmic trees. With the help of Matias Legare, Minimal Cine and Arrow Interactiva we projected the xtree to an interior wall of a warehouse space as a benefit for L.I.F.E Argentina, an organization trying to raise money to plant trees in Villa 15, La Ciudad Oculta.